Coverbind Portfolio wrap-around thermal binding covers provide a traditional look to your hard-bound documents. The slight embossed ridges along the cover create an appealing look and feel. There is a die-cut window on the front cover-that way you can showcase the project or company title or logo. The adhesive embedded on the book binding fabric ensures that no pages will be lost. Available in a rich navy blue color, there are 12 different sizes, ranging from a sheet capacity of 15 to 500. A variety pack is also available if you have a lot of projects of different sizes. Welcome to MyBinding video. 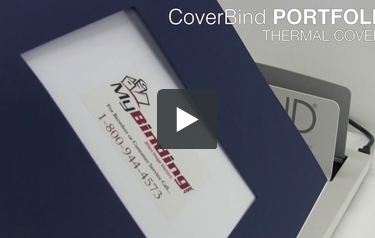 Let’s have a look at CoverBind’s Portfolio Thermal Covers. Able to bind up to 120 sheets, these CoverBind portfolio folders are a great thermal cover. With an impressive textured pattern and open window on the front for personalization and customization, you’ll have a great looking professional project. As with many of the covers by CoverBind, the thermal strip is built right into the spine of the book for you so you simply put the insides into the outside, call it all up, make it nice and straight and place it into whatever thermal binding system you’ll be using. These work great on any of the CoverBind thermal systems. The window on the front is 5 3/8” x 3 9/16”. After fully curing, the adhesive is very strong and your book will not come apart. 5 different sizes offering 15-120 sheets, this is a great cover and that is CoverBind’s Portfolio Thermal Cover. For more demos, reviews and how to’s, check out MyBinding.com.